“If something happens with that pipeline, at 400 feet we’re looking at a fatality rate of 100%,” said mother and Peekskill resident Courtney Williams. She was giving gubernatorial candidate Cynthia Nixon a tour of the AIM fracked gas pipeline that runs through her community. Stop number three of the tour was the Buchanan-Verplanck Elementary School, where her daughter, Irene, and son, Gunnar, go. Irene, along with her friends Katerina and Aurelia, showed Nixon the kindergarten playground where her brother plays. She’ll be in third grade this fall and plays on the other playground, she tells Nixon. The kindergarten playground is the closest to the highly pressurized gas pipeline, just on the other side of a small hill. The pipeline’s proximity to the school is one of the reasons, Yvonne Reasen, Katerina and Aurelia’s mother, is moving her family out of the area. 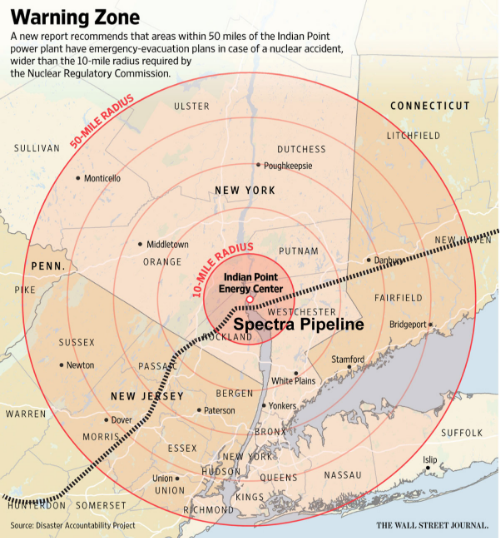 In addition to all the inherent dangers of a pipeline transporting highly pressurized fracked gas through a densely populated area, the AIM pipeline runs within 105 feet of critical infrastructure at the Indian Point nuclear power plant. Because of these risks residents of northern Westchester and New Yorkers living within the 50 mile evacuation radius have been calling on Governor Cuomo to shut down the AIM fracked gas pipeline for years. After providing key permits for the pipeline in May 2015, amid ongoing protests and community outrage, Governor Cuomo called for an eleventh-hour independent risk assessment in February 2016. Once elected officials woke to echoed statewide demand to halt the pipeline, State Senators Charles Schumer and Kirsten Gillibrand filed a request with the Federal Energy Regulatory Commission (FERC), in May 2016, to halt pipeline construction until the risk assessment was completed. FERC denied their request. For years, communities along the pipeline, which continues across Westchester County into Connecticut, have called for the completed study to be released. In March 2018 the Peekskill Common Council passed a resolution calling on Governor Cuomo to release the risk assessment. The risk assessment confirmed what community members and experts have been saying all along, that a highly pressurized fracked gas pipeline near an aging and failing nuclear power plant is not safe. But so far it doesn’t appear that Governor Cuomo plans to take action. Instead of shutting the pipeline down, he is passing the responsibility on to two federal agencies, the Nuclear Regulatory Commission and FERC, the latter has already once ignored New York State request to shut the pipeline down and is commonly referred to as a rubber stamp for the fossil fuel industry.